by Roger L. French P.E. BSEE, President Geo Cooling & Heat, Irvine, California. Mr. French is a registered professional electrical engineer with licenses in California, North Dakota, and Virginia. Mr. French has specialized on GeoExchange open loop systems using shallow ground water sources. What is a GeoExchange System? A geoexchange system is an electrically powered heating and cooling system for interior spaces. This system utilizes the earth (or a pond or lake) for both a heat source and a heat sink. 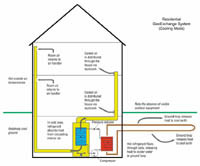 Components of this system include a heat pump, a hydronic pump, a ground heat exchanger, and a distribution subsystem. Most geoexchange systems utilize air ducting for the distribution system, and polyethylene piping in the earth for the heat exchanger. A heat pump is an electrically powered mechanical device that takes heat from one location and moves it to another location. A typical air conditioner is a form of a heat pump in that it takes heat out of the interior space and then rejects that heat outdoors. However, a true heat pump can work in either direction, unlike a typical air conditioner. A heat pump can take heat out of an interior space, or it can put heat into an interior space. 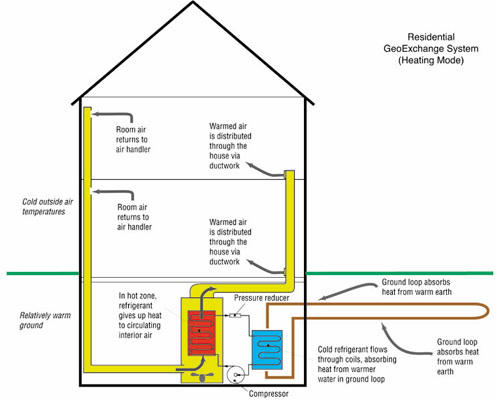 What is a GeoExchange Heat Pump? Heat energy always flows from areas of higher temperature to areas of lower temperature. The greater the difference in temperature between two adjacent areas, the higher the rate of heat transfer between them. Refrigerators, air conditioners, and heat pumps all operate by pumping refrigerant through a closed loop in a way that creates two distinct temperature zones–a cold zone and a hot zone. The simplest example of such a system is the universally familiar home refrigerator. In a refrigerator, a fan blows the air inside the box over tubes containing refrigerant that is very cold (typically below 0° F). Heat flows from the interior air to the cooler refrigerant. The refrigerant is then pumped to the high-temperature section, which is exposed to room air outside the refrigerator box. Because the refrigerant is hot in this zone, it gives up heat to the relatively cooler air in the room, before flowing back to the cold zone to begin the loop again. An air conditioner works in exactly the same way, except that it extracts heat from the air inside a room or building and transfers it to the air outside the building. 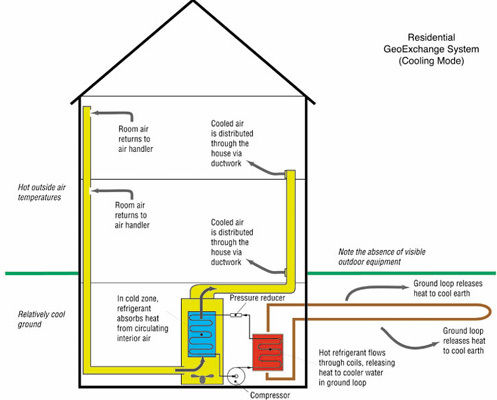 A conventional heat pump adds a reversing capability, so the hot zone and the cold zone can be switched. With the zones reversed, it can extract heat from the outside air in the winter and transfer it inside. Granted, being able to extract heat from frigid winter air seems like it shouldn’t work, but it will if we can expose the cold air to refrigerant that’s even colder than it is. And modern heat pumps can do that. When the outside air gets extremely cold, the conventional (air source) heat pump has to resort to electric resistance heating. This reduces efficiency dramatically. Standard (air source) heat pumps, while relatively simple to operate, face one major challenge: their operating efficiency is lowest when demand is highest. That is, heat pumps (air source) have to work hardest when we demand the most performance from them. As we’ve just seen, a regular heat pump (air source) extracts heat energy from outside air in the winter, and rejects heat to outside air in summer. Unfortunately, the colder the outside air, the more difficult it is to extract heat from it, and the hotter the outside air, the harder it is to transfer heat to it. The temperature difference between the air and the refrigerant is small in both cases, lowering heat transfer rates within the system. Yet, the colder it gets outside, the higher the rate of heat loss through windows, around doors, and through walls and roofs, and the more heat we need to pump inside to keep indoor temperatures comfortable. In summer, we face a similar dilemma. The hotter it gets outside, the higher the rate of heat infiltration into the house, and the more heat removal we need to maintain comfort. A GeoExchange system eliminates this dilemma by using the relatively constant temperature of the earth as a heat source in winter and a heat sink in summer, instead of outside air. Throughout most of the U.S., the temperature of the ground below the frost line (about 3 to 5 feet below the surface) remains at a nearly constant temperature, generally in the 45 ° -50 ° F range in northern latitudes, and in the 50 ° -70 ° F range in the south. So, in the winter, a GeoExchange unit can extract heat from the earth that’s relatively warm compared to the cold outside air, and in the summer, it can discharge heat to the earth that is relatively cool, compared to the hot outside air. Since the difference between the refrigerant temperature and the ground temperature remains relatively high in both seasons, so do heat transfer rates. Consequently, the GeoExchange system operates at much higher year-round efficiencies than a standard heat pump. Installing a GeoExchange system is environmentally responsible. Since a GeoExchange system merely transfers heat from the ground into your home in winter, you don’t need to burn any fossil fuels to create a warm interior environment. The approach drastically reduces carbon dioxide emissions (a greenhouse gas) compared with the operation of other heating systems, and completely eliminates the heating system as a potential source of carbon monoxide fumes within your home – making the GeoExchange system an environmentally friendly as well as safe and healthy alternative to traditional oil and gas furnaces. The unique aspect of the GeoExchange system, and the key to its lengthy list of benefits, is the “ground loop.” The ground loop provides the means of transferring heat to the earth in summer, and extracting heat from the earth in winter. There are “closed loop” and “open loop” systems. First, let’s look at typical closed loop systems that recycle the same water (the refridgerant) endlessly. Physically, the ground loop consists of several lengths of plastic pipe typically installed either in horizontal trenches or vertical holes that are subsequently covered with earth and landscaping of your choice. Water inside the ground loop piping is pumped through a heat exchanger in the GeoExchange unit. In the summer, it absorbs heat from the refrigerant hot zone and carries it to the ground through the ground loop piping. In winter, it absorbs heat from the earth through the ground loop, and then transfers that heat to the refrigerant cold zone. The length of the ground loop will be determined by the heating and cooling loads, which are determined in turn by the size of your home, its design and construction, its orientation, and the climate where you live. Whether the ground loop is most efficiently installed in horizontal trenches or in vertical boreholes depends on the type of soil near the surface (rocky, sandy, clay-laden, etc. ), the geology of the deeper terrain in your area, and the amount of land available. Generally, horizontal loops are less expensive to install, but require more land area. Vertical holes require much less land area, but require the expense of drilling. Another ground connection scheme – an “open loop” system – involves using wells instead of closed loop piping. Where water is plentiful, it can be pumped out of a well, through the heat exchanger at the GeoExchange unit, and then pumped back into another well to return to the groundwater. Since the water merely absorbs or gives up heat, but is not altered in any other way, it leaves the GeoExchange unit as pure as it was when it entered it. Any one of these installation schemes results in the same high efficiency, when properly sized. Moreover, once the ground loop is installed, you can typically forget about it. The polyethylene piping (the same type used for cross-country natural gas lines) does not degrade, corrode, or break down in ground or water contact, so sound installations are expected to last 50 years or more. As a side benefit, most GeoExchange systems can be designed to produce free hot water during the summer, by using waste heat extracted from the interior air during the air conditioning season. Even in the winter, waste heat from the GeoExchange heat pump can be converted to hot water to reduce the energy costs of the hot water heater. The Environmental Protection Agency and the U.S. Department of Energy have both recognized geoexchange technology as the most efficient and environmentally friendly home heating and cooling system available. According to studies by the Environmental Protection Agency, GeoExchange systems achieved a 48% increase in efficiency over gas furnaces, a 75% increase in efficiency over oil furnaces, and 40% greater efficiency over air source heat pumps. This all sounds wonderful, but just how does this relate to the consumer in California where electricity costs are sky high, or to the homeowner in New England thinking about replacing an oil furnace? This analysis seeks to investigate the actual comparison costs of GeoExchange systems to other conventional HVAC systems. The emphasis here is to present real world cost comparisons to be used by consumers as a tool for determining expected operating expenses, and payout times for new and replacement installations. Nearly all conventional residential and light commercial buildings use refrigerant type air conditioning systems for cooling the interior space. These units all have the familiar outdoor condenser units. Variations include packaged heating/cooling units and air source heat pumps. All use outside air to cool the refrigerant, while rejecting heat into the surrounding air. For the purposes of this discussion, all of these units will be referred to as “air source” equipment. Comparisons between GeoExchange Heat Pumps (GHP) and conventional air source units are convoluted because of the sharp decrease in efficiency of air source equipment as a function of outside air temperature. Manufacturers of air source equipment are quick to post impressive EER and SEER numbers on their “high efficiency” models, but a closer examination of the actual performance data shows that these lofty numbers do not correlate well under realistic installed conditions. A typical example of a 3-ton air source unit shows manufacturer’s SEER as 12.0. However, a closer look at performance values yields a calculated EER value of 10.5, at rated conditions (95° F entering condenser air, 67° F wet bulb evaporator). This would represent a daytime temperature of about 90° F.
When the outside temperature rises to 100° F, the air source EER drops to 9.2, which represents a reduction in efficiency of 12%. If outside temperature rises to 110° F, the air source EER drops even further to 7.7, which represents a reduction in efficiency of 27%. This means that the unit is requiring 27% more electricity to yield the same cooling. Another aspect of the air source units is that the cooling ability of the unit is also a function of outside air temperature. A typical 3-ton unit can put out 3 tons of air conditioning when the outside air temperature (at the condenser) is 95° F. But, if the outside air temperature rises to 110° F (115° F entering the condenser), the unit can only put out approximately 2.6 tons, a reduction of 14%. Condensers that are clogged with dirt or debris will have even further reduction in efficiency. As indicated in the chart above, GHP systems for air conditioning are considerably more efficient than the conventional air source units. Simple calculations show that energy costs for a GHP are nominally 40% less than air source; 50% less than air source at 100 degrees; and can be as much as 55% less than air source as temperatures rise further. This efficiency analysis has attempted to examine like units for an “apples and apples” comparison. It has not included the effect of a GHP desuperheater, the hot water feature capability. In the summer, if the GHP is used to provide supplemental hot water to a conventional gas or electric water heater, the efficiency disparity becomes even greater. With the GHP’s desuperheater in service, hot water in the summer essentially becomes free. Cost comparisons between GeoExchange Heat Pump systems and Gas Fired Furnaces are difficult to evaluate for a number of reasons. First and foremost is the drastic difference in prices of both gas and electricity over time and location. From data collected by the Energy Information Administration, consumer prices for residential natural gas (per MCF) in 2000 varied from a low of $3.57 in Alaska to $21.87 in Hawaii. Even ignoring these two states, there is still a variation between $5.17 paid in Michigan and $11.29 paid in Connecticut. Attempting to establish a suitable electric rate is equally as difficult. Again from data put out by the EIA, electrical rates (per KWh) for residential consumers in 2000 varied from $.05 in Washington to $.16 in Hawaii. Other factors to consider in making attempts to compare GHP to gas furnaces include seasonal price fluctuations. In general, natural gas prices to consumers are higher in the winter, while electrical rates many times are lower in the winter. In this analysis, we will compare a typical gas-fired high efficiency furnace and a GeoExchange heat pump. The gas furnace efficiency is 80%; the GHP COP is 3.5. Calculations show that the break-even point occurs when the price of electricity per KWh is equal to 0.15 times cost of 1 CCF of gas. For example, if the energy cost of consumer gas is $1.00 per CCF, the break-even point for a GHP system is where electricity cost is $.15 per KWh. So if the cost of electricity is less than $.15 per KWh, the GHP is more economical. This is shown graphically in the chart below. To see how some real world conditions apply to the chart above, this analysis has considered the average cost of natural gas and electricity for all states during the winters of 1999-2000, and 2000-2001. We have also used the average residential electrical rate average for all states during the same time period. Since the cost of natural gas was so dramatically increased in 2000-2001, we will look at both cases individually. Actual numbers assume units operating at 36,000 BTU/Hr. Average natural gas prices during the winter of 1999-2000 were $.68/CCF, while electrical rates averaged 8 cents/KWh. From the chart, we can clearly see that the intersection of those points is in the “green” area. Actual calculations show that the cost to operate the 3-ton heating units were $.31 per hour for the gas unit and $.23 per hour for the GHP. This represents a reduction in energy cost of approximately 26%. Average natural gas prices during the winter of 2000-2001 were $.94/CCF, while electrical rates still averaged 8 cents/KWh. From the chart, we can clearly see that the intersection of those points is further in the “green” area. Actual calculations reveal that the cost to operate the 3-ton heating units were $.42 per hour for the gas unit and $.23 per hour for the GHP. This represents a reduction in energy cost of approximately 45%. Like the comparisons to natural gas, cost comparisons between GeoExchange Heat Pump systems and Heating Oil Furnaces are difficult to evaluate. Heating oil prices fluctuate due to seasonal demands, and the cyclical nature of crude oil prices. In this analysis, we will compare a typical oil fired high efficiency furnace and a GeoExchange heat pump. The oil furnace efficiency is 80%; the GHP COP is 3.5. Calculations show that the break-even point occurs when the price of electricity per KWh is equal to 0.107 times cost of a gallon of heating oil. For example, if the energy cost of heating oil is $1.00 per gallon, the break-even point for a GHP system is where electricity cost is 10.7 cents per KWh. So if the cost of electricity is less than 10.7 cents per KWh under these conditions, the GHP is more economical. This is shown graphically in the chart below. Analyzing real world energy costs, the Energy Information Administration has projected the average winter price of residential heating oil for winter 2001-2002 at $1.29 per gallon. Residential electric rates for the last two years have averaged 8 cents per KWh. From the chart, we can again see that the intersection of these two points is clearly in the “green” area. The “green” area shows us graphically that the GHP is more economical than the oil-fired furnace. Comparing 3-ton units, calculations show that the cost to operate an oil furnace is $.41 per hour. The cost to operate a GHP is $.23 per hour. Therefore, operating the GHP represents a 41% reduction in energy cost. Like the case with natural gas, comparisons with furnaces operating on propane are subject to the same difficulties due to fuel cost variations. In this analysis, we will again compare a typical gas-fired high efficiency furnace and a GeoExchange heat pump. The gas furnace efficiency is 80%; the GHP COP is 3.5. Calculations show that the break-even point occurs when the price of electricity per KWh is equal to 0.16 times cost of a gallon of LP Gas. For example, if the cost of LP Gas is $1.00 per gallon, the break-even point for a GHP system is where the electricity cost is 16 cents per KWh. So if the cost of electricity is less than 16 cents per KWh under these conditions, the GHP is more economical. This is shown graphically in the chart below. In our effort to do some real world analysis, we find that the Energy Information Administration has provided us with average propane costs for residential consumers. In 2000, average annualized cost of LP Gas was $1.17 per gallon. For six months into 2001, the same gallon of LP Gas has averaged $1.36 per gallon. With our two-year average electricity rate of 8 cents per KWh, we can clearly see that the intersection of these two points is clearly in the “green” area for both 2000, and 2001. Again, the “green” area shows us graphically that the GHP is more economical than the LP Gas-fired furnace. Comparing 3-ton units, calculations show that the cost to operate an LP Gas-fired furnace is $.57 per hour for 2000, and $.67 per hour for 2001. The cost to operate a GHP is $.23 per hour. Therefore, operating the GHP represents energy cost reductions of 60% and 67% respectively. The analysis here is consistent with the EPA’s results, although our assumptions appear to have been chosen more conservatively. Regardless, it is clear that GeoExchange systems are significantly more efficient and less costly to operate than all other methods of heating and air conditioning systems.